A colourful write-in book, full of curious characters, unusual places and exciting ideas to help young children write imaginative stories. With fun activities including word games, story mazes, and inventing diary entries for characters, and tips on developing characters, writing descriptively and using similes and metaphors. A fun and creative book that will spark inspiration and let children’s imaginations run wild. For younger writers, My First Story Writing Book gives them all the prompts they need to turn readers into writers. Another brilliant education activity book by Usborne. 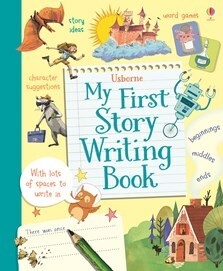 This book is just what you need to help your children get into creative writing.